I think I was in college when I had my first snickerdoodle. I didn’t grow up with them, but we enjoyed lots of other cookies in our house, so I wasn’t totally deprived! Well, these cinnamon cookies quickly became a favorite of mine and rank right up there with chocolate chip and oatmeal cookies as a great after school or work snack. I like how these crackle on top and the color of the cinnamon sugar contrasts with the soft creamy-colored interior, and I dearly love the smell of them baking. They smell like autumn to me, and they pair perfectly with a tall glass of milk or a cup of hot chocolate, tea, chai, or coffee, basically anything you drink while eating good cookies! Michael’s mom bakes them every year when we make our trek to the Meyers camp in the Adirondacks, and they don’t last long, especially with my boys around! We enjoy this classic version with cinnamon, but you can also spice them up with ginger, allspice, cardamom, and chocolate! 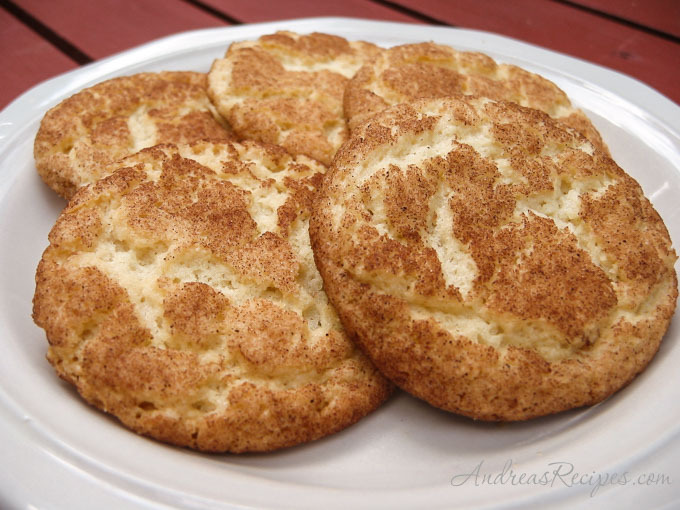 Check out the links to some other yummy snickerdoodles in the Variations below. This is an old recipe which calls for shortening, which was once quite popular in cooking. I generally prefer unsalted butter for baking, and you can substitute equal amounts here, just keep in mind that butter has a liquid content of around 20% and shortening has no liquid. Because of the liquid content, cookies made with butter tend to spread more, making them thinner and crispier than cookies made with shortening, but they also taste better. Freezing the formed dough for a few minutes before baking will help the butter melt slower thus retaining the cookie shape better in the oven. Adapted from Ann Meyers, from an old cookbook (title unknown). I think I will have mine with Chai, my favorite tea… these look so yummy Andrea! Perhaps you’ll know the answer to this Andrea – I always thought Snickerdoodles were supposed to have a piece of chocolate inside of them, probably because that is how I was introduced to them. Are they? Jenny, I can’t say for certain, but according to Wikipedia, nutmeg, raisins, chocolate chips, and nuts are all common variants for snickerdoodles. This reminds me of home, would sure like some now here in Prague where it is snowing and bitter cold. Great picture, your photographs are great! Yummmy! Say, what is cream of tarter and what is it made out of … it seems like it’s used when you need something with lift…is this true? Gift of Green: Yes, cream of tartar is used for baking and acts as a leavening agent when combined with baking soda. It also is a good stabilizer for whipping egg whites. I found an informative article about cream of tartar on OChef.com. Snickerdoodles are my favorite cookie. Yours look fantastic! I need some advice. I made Snickerdoodles this week and they puffed up but never flattened out. They were also very dry tasting. (Not burnt or overcooked, just dry) I’ve made these dozens of times before (same recipe as yours) and never had this problem. After I made them this week, I went out the next night and bought all new ingredients and made another batch and the same thing happened. My butter was softened, but not melted. In the first batch I used the baking soda that I had in my cupboard but I used a brand new box on the second batch. My cream of tartar was brand new. Hi Mary. The only thing I can think of is that the cookies stayed in the oven too long and the middles cooked all the way. Snickerdoodles should come out of the oven with the edges cooked and the middle still a little soft so that they can “fall” and crackle.